My friend Leila makes the most amazing quilted items. She just released a pattern for these scrappy leaf key fobs in her Etsy shop!! I am so happy to be giving away one of her patterns! Trust me, it is a great pattern and if you are like me, and cannot part with your precious scraps, this is the pattern for you!!! I also made a necklace from Leila's pattern. I just reduced the pattern by 50% and added a sterling silver jump ring and chain. Surprise - I'm also giving away a necklace!! All you need to do is leave a comment on this post with your choice of colors for your custom leaf necklace. Give Away is open until Sunday at midnight PST. Be sure to check out Leila's Etsy shop. She has some amazing items for sale!! I love Leila's pattern - so pretty! I'd love a necklace in greens! Oh, fun! Gee, I am not sure what color necklace I would like most so I think I might have to say surprise me. You never make a thing that I don't like! The smaller scale works really well as a pendant, very sweet! Love it! So cute! I'm a green freak myself but would love anything you did! How fun. I just love your work. So lovely - I would like one in greens also please! You're so sweet to offer a custom made necklace. If I win, I'd love some orange & pink. Turquoise and red. Love the necklace! HI, green and blue are my favourite colours, but your necklace I love ALL!! What a gorgeous giveaway. I love Leila's stuff :) And the necklace is the sweetest thing. Such a perfect idea! Green's my favourite, but I don't think you could make anything I wouldn't like!! What a cute pattern! I'd love green with a hint of purple. Anyone that you choose, they are all soooooo cute! 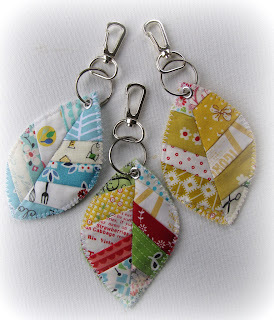 I would so totally use this pattern, I'm being overrun by scraps! Thanks for the giveaway. These are so adorable and your necklace so fab too. I'd love to win, if I did i'd love mine in navy and white, maybe with some red, or orange, or mustard oh you choose, I like too many colours! SO sweet!! What an adorable pattern. Love it! I would choose red, white and blue if I were to win or make one ;-) Thank you for this opportunity! This is adorable!! I like the one on the left but like it in a necklace pendant. very sweet idea. This would be fabulous in blues and greens -- both for keys and luggage tags. Oh! I'd love something a bit edgier- like black & white with the fuschia I saw all over New York fashion week these last few days! Quilting can be fashion-forward too! These are so cute! :) I love the colors of the necklace that you made. This is adorable - both the necklace AND the key fob - and how nice of you to showcase these! I can see a necklace in jewel tones - deep purple, deep yellow, some dense lime, maybe some fuscia, maybe even some dusky gray for dimension. so cute. I'd love a purple one. Oh my gosh, What a perfect gift...not sure I am skilled enough for such small detail work. But I am thinking how spring like it would look in pinks and greens... I am sure it would be a hit if I wore it in my classroom! I am going to check out the pattern over on Etsy...as this would be a terrific "signature" gift for my teacher friends! Thanks for being so generous, as to give one of your gems away! LOVE it!!! Blue would be nice, but it would be great in any color!! What a lovely give-away! 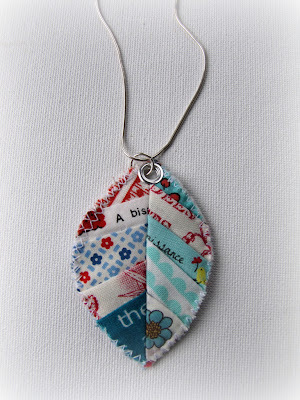 I love this as a necklace, what a great idea!